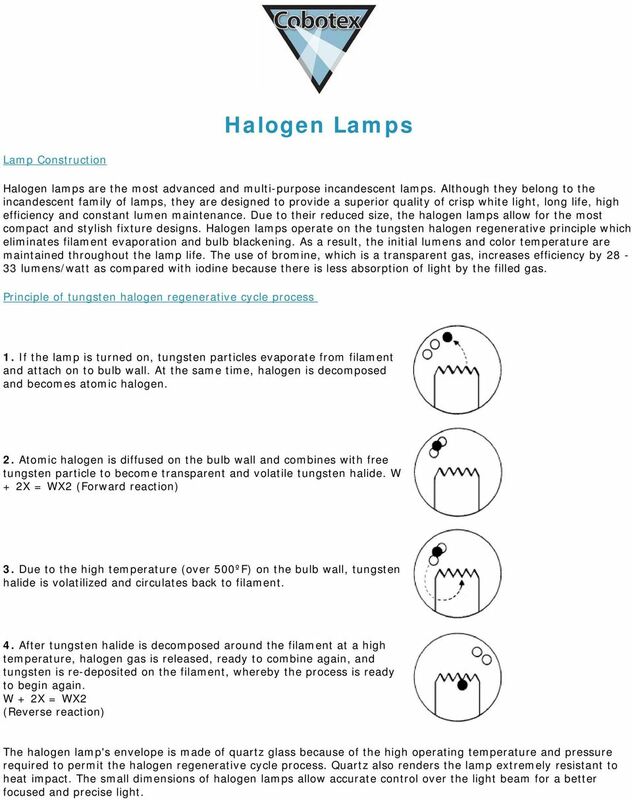 Download "Halogen Lamps. 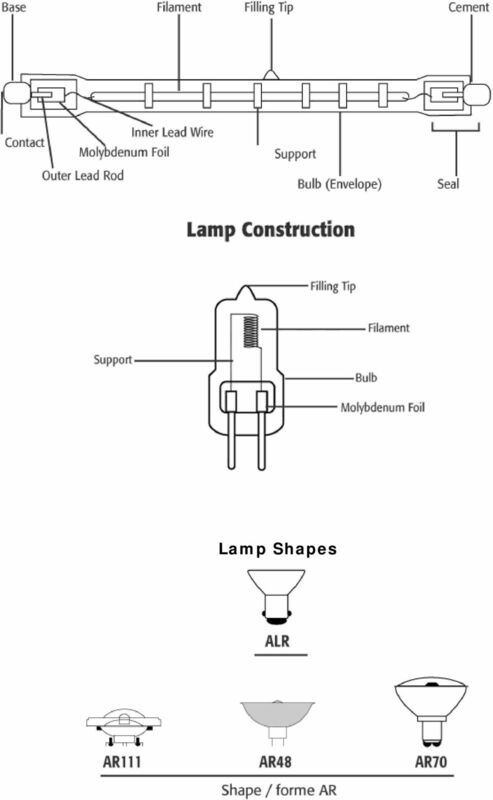 Lamp Construction"
1 Halogen Lamps Lamp Construction Halogen lamps are the most advanced and multi-purpose incandescent lamps. Although they belong to the incandescent family of lamps, they are designed to provide a superior quality of crisp white light, long life, high efficiency and constant lumen maintenance. Due to their reduced size, the halogen lamps allow for the most compact and stylish fixture designs. 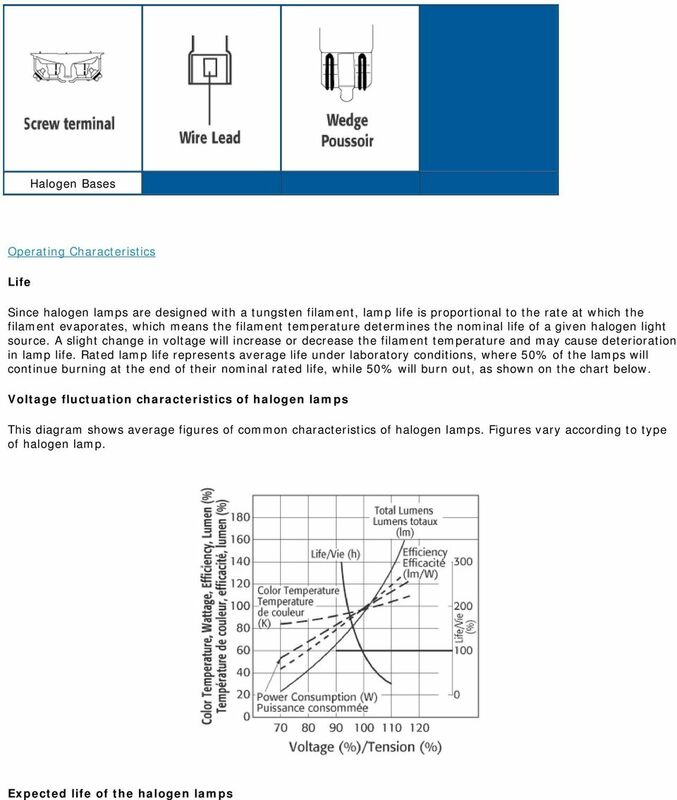 Halogen lamps operate on the tungsten halogen regenerative principle which eliminates filament evaporation and bulb blackening. As a result, the initial lumens and color temperature are maintained throughout the lamp life. The use of bromine, which is a transparent gas, increases efficiency by lumens/watt as compared with iodine because there is less absorption of light by the filled gas. Principle of tungsten halogen regenerative cycle process 1. If the lamp is turned on, tungsten particles evaporate from filament and attach on to bulb wall. At the same time, halogen is decomposed and becomes atomic halogen. 2. Atomic halogen is diffused on the bulb wall and combines with free tungsten particle to become transparent and volatile tungsten halide. W + 2X = WX2 (Forward reaction) 3. Due to the high temperature (over 500ºF) on the bulb wall, tungsten halide is volatilized and circulates back to filament. 4. After tungsten halide is decomposed around the filament at a high temperature, halogen gas is released, ready to combine again, and tungsten is re-deposited on the filament, whereby the process is ready to begin again. W + 2X = WX2 (Reverse reaction) The halogen lamp's envelope is made of quartz glass because of the high operating temperature and pressure required to permit the halogen regenerative cycle process. Quartz also renders the lamp extremely resistant to heat impact. The small dimensions of halogen lamps allow accurate control over the light beam for a better focused and precise light. 4 NOTE: Drawings are not to scale. 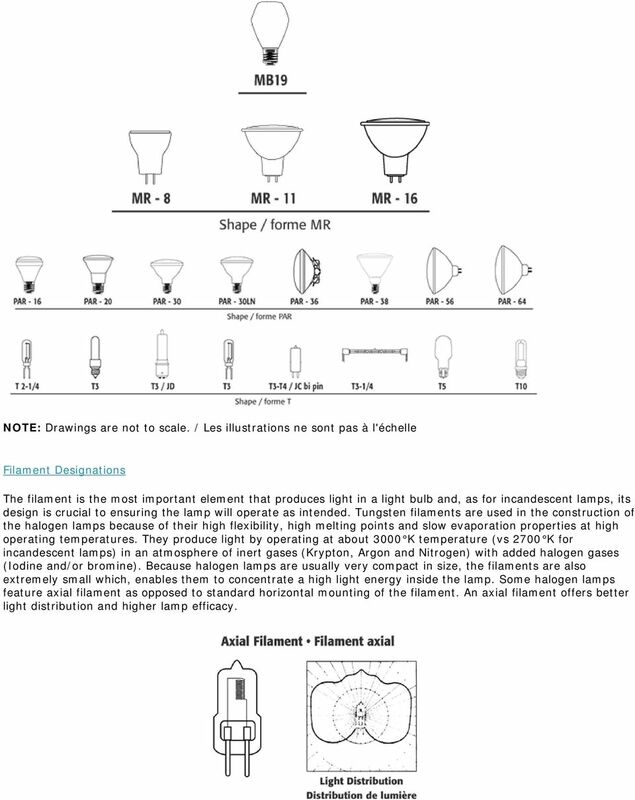 / Les illustrations ne sont pas à l'échelle Filament Designations The filament is the most important element that produces light in a light bulb and, as for incandescent lamps, its design is crucial to ensuring the lamp will operate as intended. Tungsten filaments are used in the construction of the halogen lamps because of their high flexibility, high melting points and slow evaporation properties at high operating temperatures. They produce light by operating at about 3000 K temperature (vs 2700 K for incandescent lamps) in an atmosphere of inert gases (Krypton, Argon and Nitrogen) with added halogen gases (Iodine and/or bromine). Because halogen lamps are usually very compact in size, the filaments are also extremely small which, enables them to concentrate a high light energy inside the lamp. Some halogen lamps feature axial filament as opposed to standard horizontal mounting of the filament. An axial filament offers better light distribution and higher lamp efficacy. 5 Filaments come in various shapes for many different applications. Similar to the incandescent filament designations, halogen lamp filaments are identified by a letter or letters which indicates a coiled wire (C) or coiled coil wire (CC), followed by a number to indicate the shape of the filament. NOTE: Drawings are not to scale. / Les illustrations ne sont pas à l'échelle. 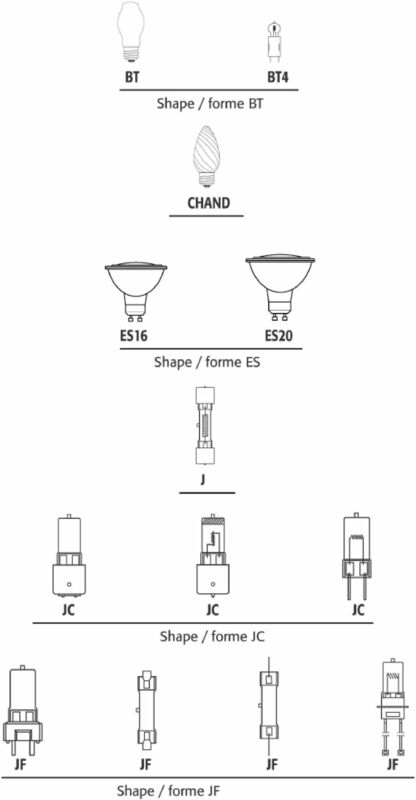 Bases Halogen lamps come with a variety of bases, some of which are common to both incandescent and halogen lamps. Some are single built-in and/or Bi-pin and are particular to halogen lamps and infrared quartz. They are usually made of steatite or heat resistant metal. Double-ended type halogen lamps feature a plug-in and out RSC base. Lead wire type is becoming more and more popular for use in certain heater lamps because of connection reliability. 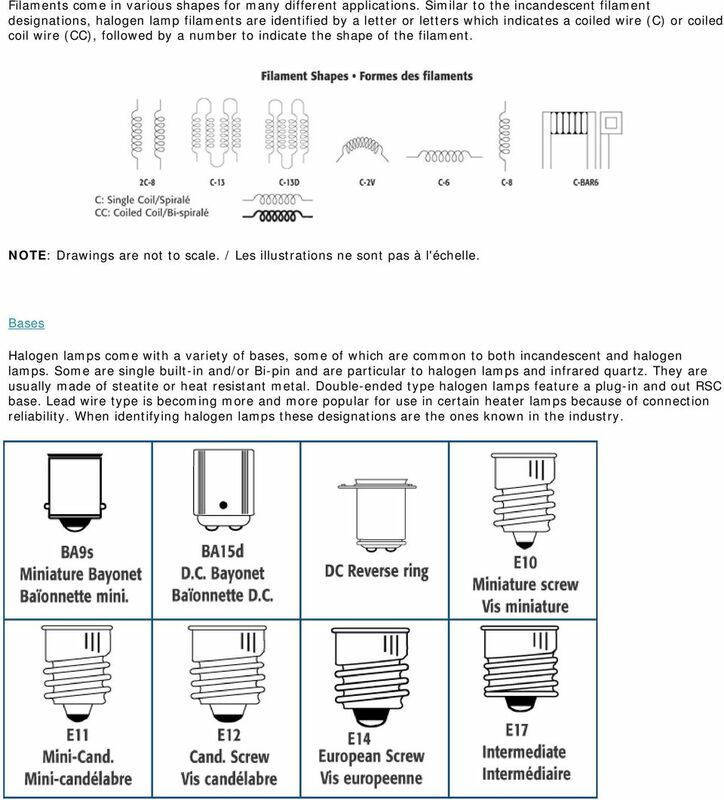 When identifying halogen lamps these designations are the ones known in the industry. 8 Dimming Halogen lamps are designed to operate at very high temperatures to ensure optimal performance. Dimming at above 60% of the rated volts can be done. 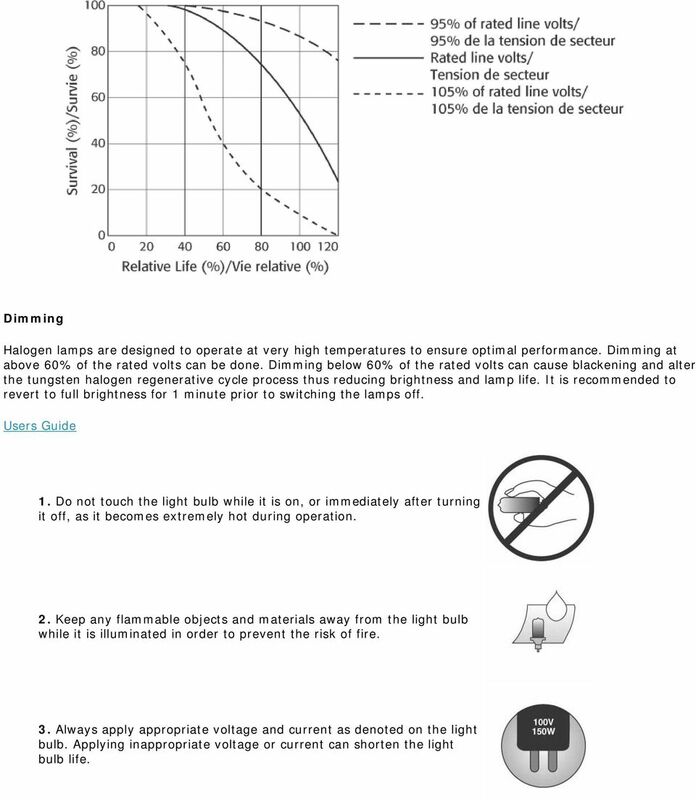 Dimming below 60% of the rated volts can cause blackening and alter the tungsten halogen regenerative cycle process thus reducing brightness and lamp life. It is recommended to revert to full brightness for 1 minute prior to switching the lamps off. Users Guide 1. Do not touch the light bulb while it is on, or immediately after turning it off, as it becomes extremely hot during operation. 2. Keep any flammable objects and materials away from the light bulb while it is illuminated in order to prevent the risk of fire. 3. Always apply appropriate voltage and current as denoted on the light bulb. Applying inappropriate voltage or current can shorten the light bulb life. 9 4. Use clean gloves to handle halogen light bulbs. If dirty, wipe with clean, soft cloth, soaked in alcohol. 5. Please keep the burning position if it is specified. 6. 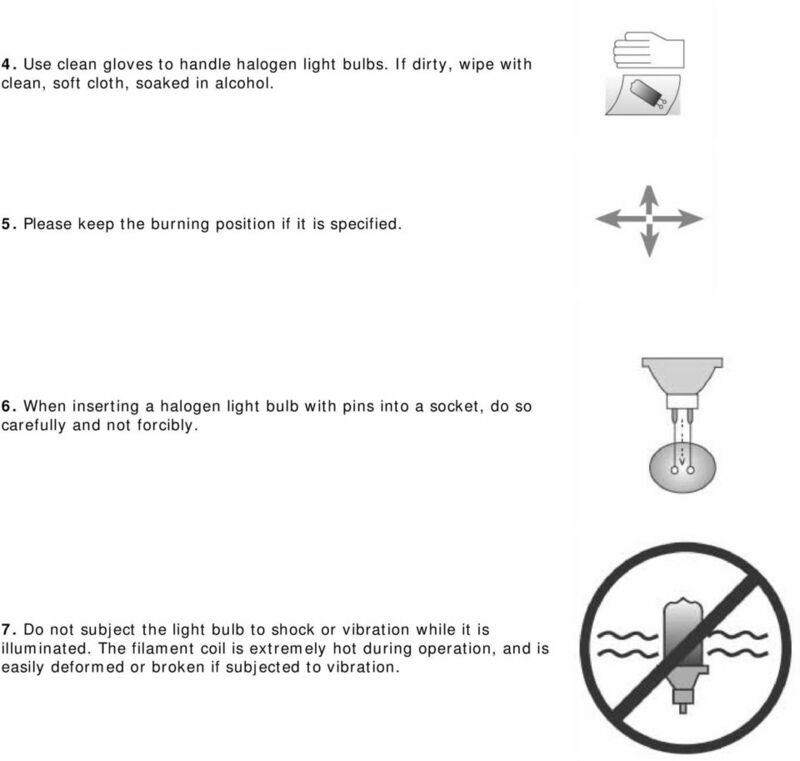 When inserting a halogen light bulb with pins into a socket, do so carefully and not forcibly. 7. Do not subject the light bulb to shock or vibration while it is illuminated. The filament coil is extremely hot during operation, and is easily deformed or broken if subjected to vibration. Module 2 Lamps Version 2 EE IIT, Kharagpur 1 Lesson 7 Incandescent Lamps Version 2 EE IIT, Kharagpur 2 Instructional Objectives What are Incandescent Lamps? State the Components of an Incandescent Lamp. 7.3 Resistance. 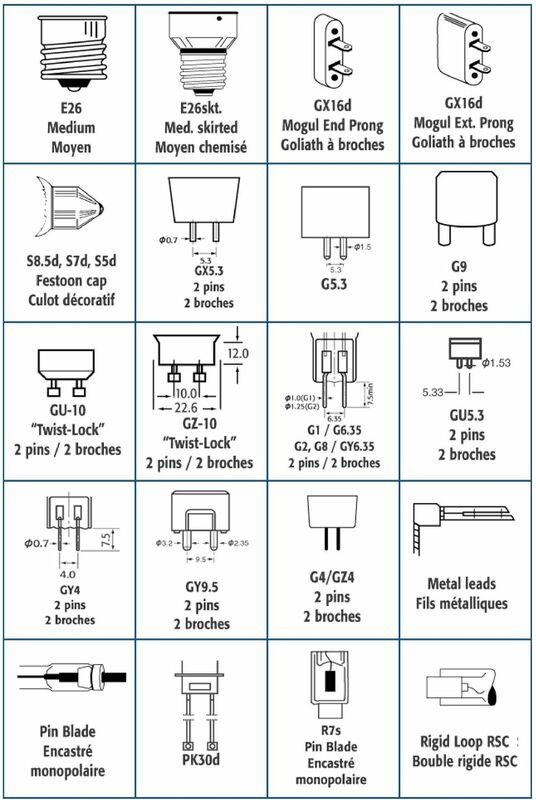 Conductors and insulators. Chapter 7. Why are some materials conductors and some insulators? Lighting This guide to energy efficient lighting will help you reduce your energy use, which saves you money and helps the environment. Do not touch glass part of the bulb with your hands during installation. Energy efficient lighting for your home find out more. Key Concept: The periodic table is a map of the elements. Operating Instructions Bedienungsanleitung Mode d emploi DW 400 www.bron-kobold.com Operating instructions DW 400 Before use Please read all the information contained in these operating instructions carefully. Combusting Candles. Category: Chemistry Type: Class Experiment (60 min) Materials List: Be careful! This activity involves working with open flames. Combusting Candles Category: Chemistry Type: Class Experiment (60 min) Materials List: 2 Tealight candles 1 Nail 1 Glass Jar with a flat top, e.g jam jar 1 Lighter or matches Video: (youtubelink) Be careful! Germicidal Lamp Definition. A germicidal lamp is a special type of lamp which produces ultraviolet light (UVC).